This book has two general editors, Joe Jordan and Tim Davis. It is a compilation of 21 articles on prophecy beginning with Daniel’s visions of the Roman Empire and going through The Great White Throne Judgment. Contributors include John Walvoord, Charles U. Wagner, Thomas D. Ice, J. Dwight Pentecost, Charles Ryrie, Elwood McQuaid and others. This would make a good group study on the end times and would not embarrass the pretribulational premillennialist. I have used various chapters this year in our Wednesday night study on the Tribulation and surrounding events. Many people in our churches have not been taught some of these basic prophetic truths that many others have heard all of their lives. 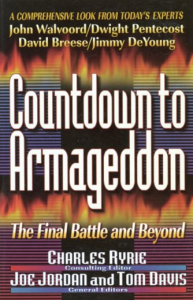 In light of all the Y2K talk, 1999 is a good year to review prophetic doctrine and this is a great help.